I am venturing a declaration, that we have all heard that exercising the brain helps it. Whether it helps stave off memory loss, helps keep our memory sharp, or just helps keep our brain sharp, I bet we have all heard “exercising” it helps. I bet one of the “exercises” you’ve heard suggested is puzzles. Brain puzzles, as an example and as suggested in my last post. Well, as I was trying to come up with a picture for the post, I was thinking I wanted to have a Nia puzzle. 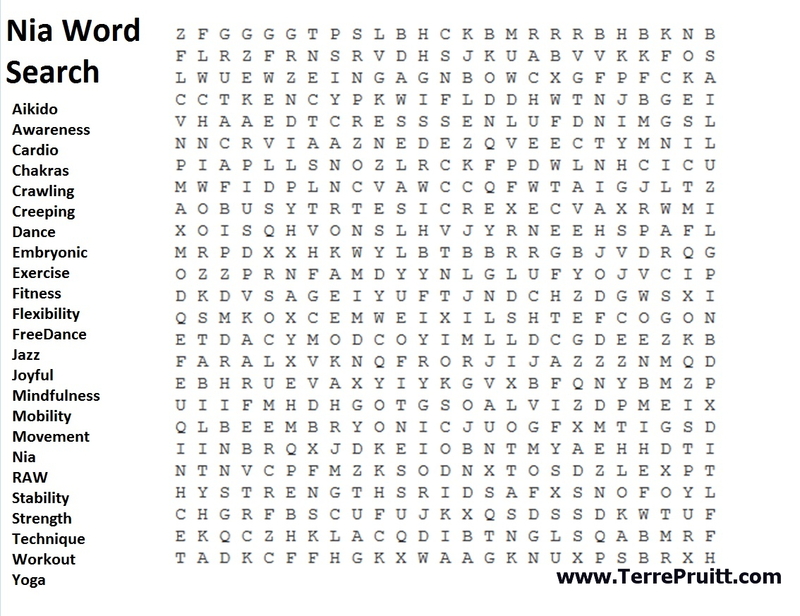 I came across a cool website where you can create a word search puzzle. I quickly decided NOT to use the puzzle I made as a picture because I wanted to make it a blog post! I decided to make a picture for that last post, so I turned to another website that I have been using lately to create collages. So this post is like a “Three-fer”, a puzzle, the website where you can create your own puzzle, and the website where you can create collages. And, yes, you can Google all of this for yourself, but you know me, I like to share. I know that I learn things from blogs I read. I learn things that are common knowledge to a lot of people, but are new to me, so I like to share because I have faith that sometimes I am sharing something new to someone! Yay! Exercise your brain! Go create stuff! The solution is at on my website (click here). Recently a Nia student came up to me after a Nia class to ask me a question. She said that she had talked to another woman about attending a Nia class but the woman didn’t want to because we said “Om!” My student asked me if Nia was religious. I shared with her what happened in the Nia White Belt Intensive I attended and my thoughts on it. What happened in the Nia White Belt Intensive I attended in December 2008, was Carlos Rosas asked one of the intensive participants what was in Nia. Her answer was “God.” Carlos said, “NO! There is no God in Nia!” I don’t know Carlos’ religious beliefs, if he has any, or how he feels about God or religion, but I think he was saying that there is no religion in Nia. It is not associated with any type of religion. It is meant for everyBODY and everyone and people of all faiths and all belief systems can participate and enjoy Nia. It truly is based on the design of the body. It is not based on ANY religion or God. I personally feel that if you have God or any belief system in you then you will bring Him/it into whatever it is you are doing. But that is not a reflection on the event or activity. With any belief if you believe it you are going to carry it with you. So if you believe in God, Gods, Buddha, Allah, or whatever that will come with you into Nia. But Nia has none of that as a part of it. What Nia DOES have as a part of it is spirit. But that should not be confused with any type of religious spirit or supernatural spirit. Wiki states: “The English word spirit comes from the Latin spiritus, meaning ‘breath'”. And an online dictionary says: “The vital principle or animating force within living beings.” Yet some people often think of spirit as religious, as in the Holy Spirit, or otherworldly, as in ghostly spirits. Because of that conversation I had with one of my students I had been thinking of this and in a class I said, “Let your spirit out.” And I noticed a few students stiffen. And I continued on, saying, “That is not to be meant religious or supernatural, I mean spirit as in ‘your school spirit’, when people say ‘show some school spirit no one gets all wiggy’. It’s like that. THAT type of spirit.” And I saw people relax. I saw some say, “Oh.” And then I saw some spirit. I think of spirit as a passion or your inner child. It is the part of you that wants to slide down the banister, run up the down escalator, balance on a curb, jump in the puddles, take your shoes off and slide in stocking feet across the length of the mall, or say “WAAAAHOOOOO!” It is the breath that we often hold in. If your beliefs have your spirit saying or doing something in class then that is fine, but that is not to say that your beliefs are a part of Nia, that is a part of YOU that you bring to Nia. 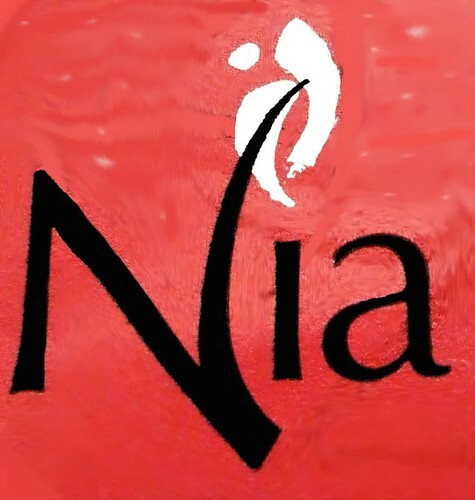 The type of spirit you would have with school spirit, class spirit, and/or team spirit that is the spirit Nia calls upon and what Nia invites to be released in a Nia class. Let your inner essence dance and be free, don’t be afraid . . . . . . let go. Every year there is a Bay Area Dance Week. This year is the 14th annual dance week and it is being presented by Dancers’ Group. This will be the fourth year that I have offered my morning Nia Classes to New Students for free. I did it last year, but I didn’t post about it. I figured I should post about it to remind people it is happening. My 9:00 am Nia Classes on Monday, April 23rd and Wednesday, April 25th at Halanda Studio will be free to New Students. Here is another opportunity to try Nia for free. In addition to Nia there are many FREE Classes during National Dance Week at Halanda Studio. Halanda Studio is owned by two women who rent out the studio by the hour. The variety of classes that are offered at the studio is very diverse. As you can see by the schedule of free classes there is several types of Belly Dancing from beginning to Intermediate/Advanced. Also being offered for free during Bay Area Dance Week is Hot Hula, Yoga, Zumba, Bollywood Fitness, and I’ve already mentioned Nia. While I want you to attend classes at Halanda and in particular MY Nia class, my dancing spirit has to bring to your attention to the fact that from April 20 – April 29, 2012 it is Bay Area Dance Week. So there are FREE classes ALL OVER THE BAY AREA!!! According to the Bay Ara Dance booklet there are more than 650 groups, artists, and organizations participating. There are over 100 forms of dance to enjoy. Not only are there free classes but there are free performances. The opening event is Friday, April 20th at Union Square Park in San Francisco. The closing event on Sunday, April 29 will be at 2 pm in Union Square Park in San Francisco where there will be simple circle dance for peace among people and peace with Earth. Looks like this dance will be led by the amazing Anna Halprin. She is 92 years old and still dancing and teaching dance . . . now that is what I call amazing! There are other classes taught at Halanda, but the classes listed here are the ones that are participating in Bay Area Dance Week. Aside from Nia :-), what classes are you going to try out? In Nia (TM) we have FreeDance. It is not easy for most people to do. It is not easy for me to do. I am still learning. With Nia the purpose of FreeDance is “to stimulate movement creativity”. Whoa. Stimulate movement creativity. So we FreeDance to excite growth or greater activity in changing our place, position, or postures into new places, positions or postures. Hmmmm. I will take this time to remind you that our bodies are built to move. And they are built to move a certain way. Our joints allow for certain types and amounts of movement. Now barring any ailment or disease our bodies should move like they are built. But we often don’t move that way. Our way of life keeps us from moving as our bodies were built. Sometimes social stigma keeps us from moving the way our joints would like. So in FreeDance you are invited and encouraged to break habits and to move like your body was built. I have experienced that for some, moving their head is a new thing. Think of the old way models were trained with a book on the head, some of us were taught to walk and be in that position. Can’t move your head with a book balanced on it. So moving your head could be something new in FreeDance you could do and be amazed at the result. Something as simple as moving your head, breaking that straight neck habit could release oodles of tension. Same with rigidly straight spines or tight backs. When you Free Dance you are not dancing like you would in a club, you are pushing the limits, you are moving your body to experiment with it. You are Stimulated Movement Creativity. There is so much more to say on this. This is Nia White Belt Principal number 4. This principal has 8 stages, so that alone is a lot to talk about, but for now, I will leave it at FreeDance – To Stimulate Movement Creativity. See if you can add a little FreeDance into your day. It doesn’t have to be wild, it could be done where no one even notices, just move one move a little different than you normally do, and you will be on your way to FreeDance!